THE WIND THAT WILL TAKE THE BREATH OUT OF YOU. This was one of those rare occasions where my dad, of all people, actually want to take me to a movie in the theatre instead of waiting for it to come out on blu-ray. My dad was going to see this movie, and with me being a filmmaker, I wasn't going to stop him. Honestly, I was expecting a really good movie. 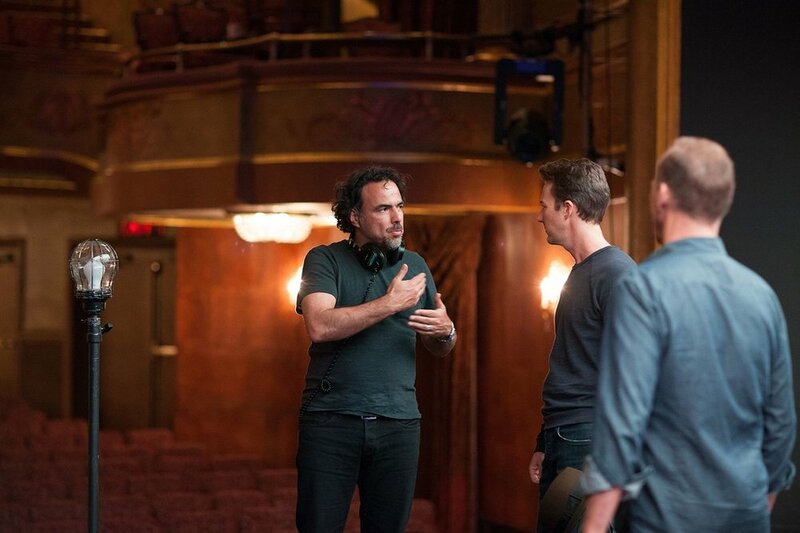 I completely trust in Alejandro G. Iñárritu after his breath-taking work on BiRDMAN. As well as Emmanuel Lubezki and his ambitiously, epicly, beautifully, amazingly, awesome cinematography. Despite there being report of some chaos on the set of The Revenant (which chaos is on most sets, especially with a film this freaking ambitious) it was a film set up for success. So, walking out of the theatre, did it hold up to my expectation? BEAUTY AND THE BEAST THAT COMES WITH IT. This movie did not meet my expectations, it surpassed them all together. I knew this was going to be a good movie. I just didn't expect the filmmakers to craft another masterpiece after BiRDMAN. But they did, and I am so pleased with the result. Making a film is no small feet. With the depth that this film had, visually, metaphorically, narratively, it had to have been a struggle to make. But this is the type of movie that reminds me of why going to the THEATRE is important. Everything about this film screams beautiful detail oriented, never ending, amazingness. It never stops. There are no bad, overly long scenes. The movie just starts and then moves from beginning to end. Beat by beat, you feel every moment as the story reveals itself. There have been complaints about this film being overly long. But I feel the scenes that really take there time in this film, were stylistically chosen to do so. If you look at BiRDMAN (which won best picture last year) you will see that in the middle of the movie, there is a long shot of an empty hallway. Like, it literally lasts a couple of minutes. Of NOTHING. But because of the style and intention behind the shot, we understand it. The Revenant feels the same to me. It's long and painful, just like the survival story our main character is experiencing. I just can't imagine making a movie like this. You literally forget you are watching a movie 60 seconds into it. As a filmmaker I understand how hard it is to do that. To manipulate your audience's mind so the real world, and the film combine. THE HEART IS RIGHT UPFRONT. Despite having the emotional pulls and story lines deep within the film, the heart of the film remains firmly upfront. What I mean by this is the Revenant is a picture that conveys the emotions of it's characters best through visuals. Which is a big deal. Most films rely on a good script and story to pull at the audience's heart strings. Although, those things are perfectly necessary, the Revenant introduces a new layer. A visual layer of poetry. Emmanuel Lubezki is, without a doubt, the man most deserving of an Oscar this year. I feel like this is a recurring theme. He won for the 2013 space thriller, Gravity. He won for last years drama, BiRDMAN. And he will probably win this year as well. But I'm not frustrated about this. I am actually quite happy he has gotten so many awards. Because he deserves every single one of them. The Revenant wouldn't have been able to achieve what it did without the revolutionary cinematography brought to the screen by the work of Lubezki. His choices are where it all begins. Where he chooses to put a one-shot-take or where he decides to move the camera next. Where the focus is going to be. His choice to only use natural light and to use the Arri Alexa 65 for the first time ever. These choices pay off in the end. His work is truly riveting and breathtaking. You can't help but immerse yourself in the world he has shot. The way he is able to move a camera in such a way that you forget that this entire world you are in, was constructed through a lens, is amazing! The way it is able to feel spontaneous and at the same time poetic. It all is breathtaking! This is one of the only films you will watch and ask, "how did they do that" now days. It feels real and gritty, while still holding an emotional relevance. It's very curious how Lubezki chooses to stay very up-close and personal, exploring the human face. This is a movie with beautiful locations, and most of the time he doesn't pay any attention to it. There are scenes where I was shocked at how big it felt, even though all of the breath-taking scenery was out of focus. Instead DiCaprio's face filled most of the screen. Directing, while not the most physical job on set, is not an easy thing to do. And with a project this ambitious and time consuming, I cannot help but acknowledge the amazing ability of Iñárritu. I don't necessarily believe in judging a director purely by his work, because how they operate on set really speaks to the maturity of a director. But from what I've seem from his work alone, I can say this man is really talented. Maybe he is not the best director in the world, but he is a masterful storyteller, no doubt. Directing a film like this takes a lot of dedication, patience and coordination. While I do think a lot of this is of the result of good ADs and a great crew, I think his ability to pull of projects like this is really a testament to his directing maturity. CAT & MOUSE.... AND A BEAR. The performances in this film we're second to none this year. This film had a stellar cast! Everyone from Forrest Goodluck, to Domhnall Gleeson, and finally Will Poulter were great in this film. But the leads really stand out to me. Seriously, the acting of the three main characters is really top notch. Yes... I said three. The bear was the best part of the movie, and that is a fact. Let's talk about watching Leonardo DiCaprio suffer for two hours... It was real. You felt every breathe he took. You felt like you were surviving with him. The makeup department really helped sell the pain he was enduring. But his performance was the thing that sealed the deal. The movie is filled with character development, and character arcs. I just ate the performance up. Tom Hardy is something that I think needs to be talked about more with this movie. DiCaprio is great and all... But he's been raved about for a while now. Tom Hardy proves again that he can still innovate in the roll of the villain. He really shined as Bane in his incredible performance in The Dark Knight Rises. In this film he completely transforms into another person, again. I forgot I was looking at Tom Hardy a couple of minutes into the movie. It is quite scary if you think about it. He is way too good at becoming other people. Finally, let's take a solid second to acknowledge the Bear.... Yeah.... What a great scene. The bear was truly a feat of movie magic. And my second is up! 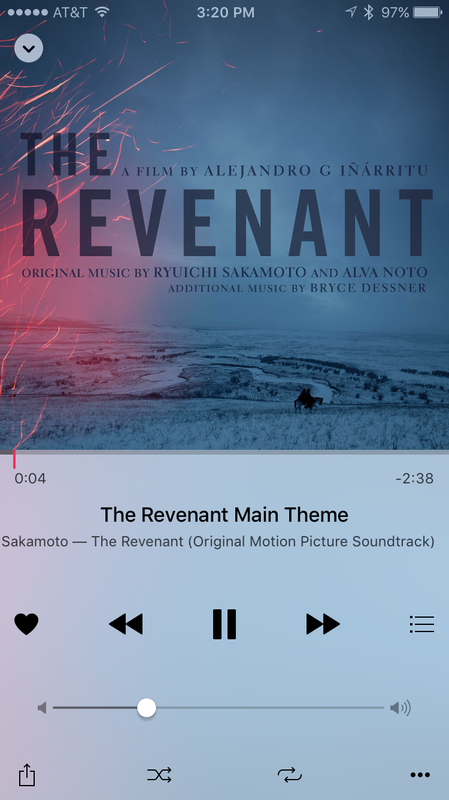 I'm not sure which score I like better this year... Steve Jobs or the Revenant? Mad Max's soundtrack was also great. The score of the revenant is really quite simple, truth be told. The main theme is just a couple of notes played in the string section. But it is really quite effective at the same time. It feels very somber and depressing, but also very beautiful. I loved the score nonetheless. I think the music in this film is just as authentic as the movie itself. It really adds an extra layer to the drama that is happening visually, and emotionally. I definitely think this will be a hit and miss (especially the pacing) because the score is slow. Nonetheless, it is an amazing soundtrack that you should totally check out. The Revenant has proven to be one of the best. It is gorgeous to look at. The story is tragic and emotional. The acting is superb and the music is really great. There's really nothing more to say. The Revenant was my favorite movie of 2015. I loved Star Wars: The Force Awakens. I loved Steve Jobs, I also had a great time at Mad Max. But I haven't watched a movie I liked better than the Revenant. I will say I have had the urge to watch Steve Jobs again, whereas I could care less if I saw the Revenant again. But I feel so much passion for the Revenant that I can't help but put it on top. The Revenant is big, beautiful, and (it feels) really long. But I think you will fall in love with this film. I know me and my dad did.